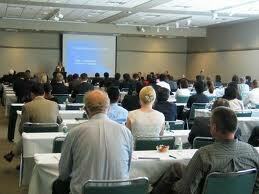 Meken Equity Management, Inc. sponsors Real Estate Seminars throughout the country. Ken Vidar, President, is involved in an active speaking schedule to various groups, real estate boards, and conventions. His “Creative Solutions” course is currently available for booking throughout the country. “Creative Solutions” touches upon the many formulas and techniques utilized in the creative real estate marketplace to structure commercial investment transactions. Information gleaned from this course is becoming even more important today in our current economy where financing has become difficult, if not impossible, to obtain in order to complete commercial transactions. Ken also participates as a moderator for marketing sessions nationwide. He is in demand by these various organizations because of his ability to extract pertinent information to successfully conclude transactions with benefits for all parties (win-win situations).